The Fresh Air Interview - Kevin Spacey, David Fincher of 'House of Cards' Academy Award-winning actor Kevin Spacey and Oscar-winning director David Fincher team up for a new Netflix original series that premieres Friday. 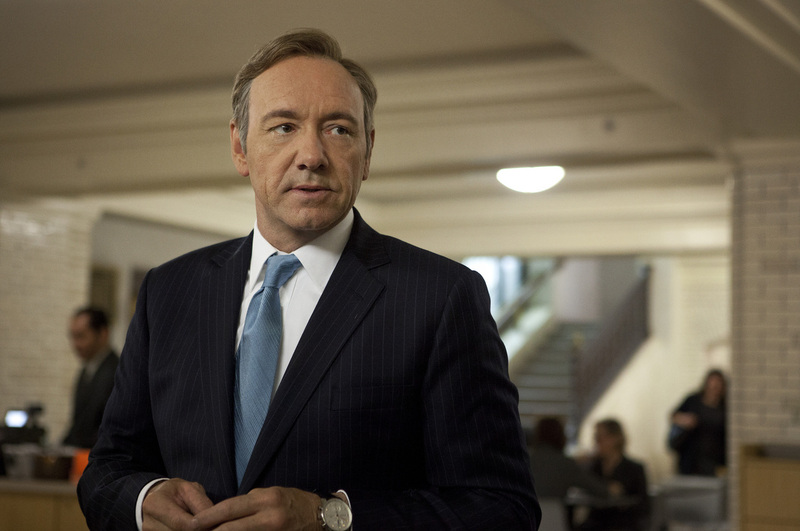 House of Cards follows a Machiavellian politician as he schemes to take down the president of the United States. Kevin Spacey is the star and a producer of the new Netflix series House of Cards, on which David Fincher is a co-producer. Ten months on the road playing Richard III in theaters around the world is a good way to prep for playing a ruthlessly ambitious politician and Washington insider — according to Kevin Spacey, at least. 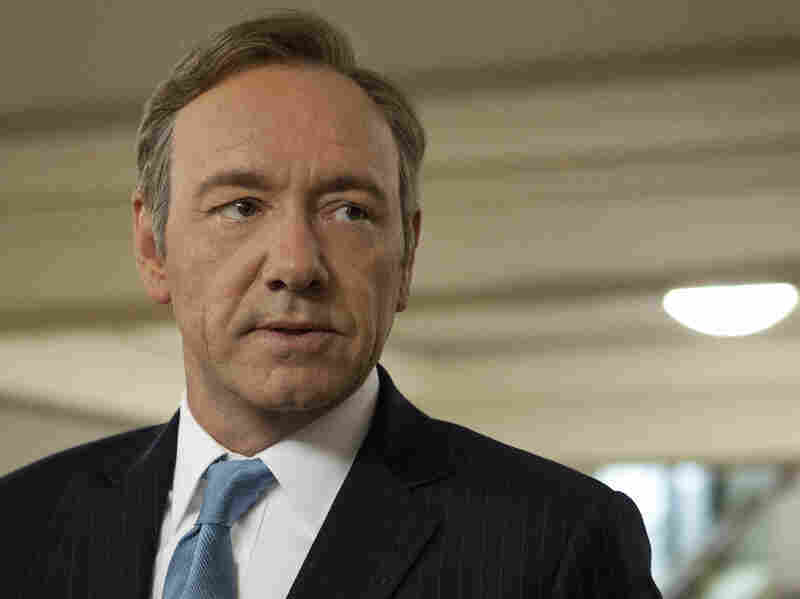 Just before he took the role of Francis "Frank" Underwood, the fictional majority whip of the House of Representatives who hatches a plan to take down the president in the new Netflix original series House of Cards, Spacey spent nearly a year playing Shakespeare's murderously ambitious king. Richard III primed Spacey for the role of Underwood not least because both characters take brief, periodic breaks to directly address the audience. "I have this memory of that experience," Spacey tells Fresh Air's Dave Davies about playing Richard III. "I was able to actually look into people's eyes all over the world and see how much they relished it, and how dangerous it was, and how sporting and naughty they felt in being sort of brought in and made Richard's — and now Francis' — co-conspirators." You're getting private time with Machiavelli. It's like you're getting private tutelage. David Fincher, the director of House of Cards, adds that when you use direct address with a character like Underwood, "You're getting private time with Machiavelli. It's like you're getting private tutelage." House of Cards, which premieres Friday, is an experiment for Netflix, which will release all 13 episodes of the first season at once. It's an experiment for Spacey and Fincher, too: Both the actor and the director are known more for their work in film than television. Spacey has starred in such films as American Beauty, Seven, The Usual Suspects and Midnight in the Garden of Good and Evil; Fincher has directed the films Girl With the Dragon Tattoo, Fight Club and The Social Network, among others. Spacey, however, says that working on this particular television series has not been dissimilar from working on movies. "In one way it feels like I'm making a really long movie," he says, "and in another way it feels like I'm in a 26-hour championship chess match because it's all about the moves and how far ahead Francis sees what ... the opponent is going to do." "The thing that I'm always questioning — and we all are – is, 'Is this arbitrary? Is this an important thing?' And sometimes we've discovered in the course of shooting that, actually, the dialogue that is written isn't necessary. All you have to do is a look. ... The way I've tried to transform my experience in the living theater — which was real people and real eyes, and now of course I'm just looking down the barrel of a lens — is to think of it as if I'm talking to my best friend in the way that you share things with your best friend that you wouldn't necessarily share with your wife. The asides, I'm trying to play them as if this is the person I trust more than anyone in the entire world." Building A Winning 'Network,' But At What Cost? "I know a lot of show business couples who, over the years, have talked about one of the reasons their marriages have lasted, or their relationships have lasted, is because they do have such [outside, independent] interests. They are off doing so many of their own projects and things that they aren't in each other's face 365 days a year. And I think that sometimes degrees and understanding of distance, and that distance in a relationship, is also valuable and important, as opposed to everything being cuddly and maudlin and co-dependent." "[C]reating a character who's from the South ... allowed us to ... [mimic] the sort of rhythmic things that a British accent can do that maybe an accent in the West or too far East might not work. ... Those sentences might not come out in quite the fluid musicality that the British accent has. So I think it was ... a really smart choice to make [Frank] from South Carolina." "Part of what I feel when he's doing that — and I like working this way — is that, you know, he's pushing you in a certain direction. He's having you go in a different direction this way; he's having you try a new meaning, a new approach to a line of dialogue in this way; and, frankly, the other truth is actors bring a lot of complicated accessories to the set. And some of those accessories are gestures, and some of those accessories are, 'Oh, I found a kind of cute way of saying a line,' or 'I like the way my voice does this,' or 'I'm going to use this Coke can to do this.' And I think sometimes, with David, it feels like [what] he's looking for is the cleanest, streamlined version of the idea that the character's trying to express. ... And he's just simply, at a certain point, beating the acting out of you. And I'm quite grateful for that." "It was truly hellish. I mean, it was Palmdale [Calif.] in summer, and it was about 140 degrees in this car and we had as many cameras as we could possibly stick in it. ... And we would drive for like five or six miles down this road, and then stop and then have to turn this entire ridiculous caravan around and go back to the beginning. ... We've fixed this, though, on House of Cards: All of our driving takes place in this very beautiful, air-conditioned green screen room."